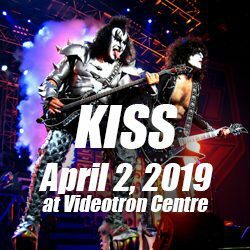 Don’t miss the latest (and most likely last) performance by rock giants Kiss at the Videotron Centre in Quebec City on April 2, 2019. End of The Road World Tour. It’s under this fitting title that the members of the legendary American quartet will bid farewell to fans from the Old Capital during the concert from Kiss at the Videotron Centre in Quebec City on April 2, 2019. April 2, 2019 will be an important date to highlight on all your calendars, dear rock lovers because, although they had already announced that their previous tour was their last, End of the Road World Tour seems to indeed represent the last opportunity to see a concert of Kiss at the Videotron Centre in Quebec City, more widely in Eastern Canada. Tickets will go on sale Friday, November 2, 2018 from 10:00, at a price ranging from $ 52.00 to $ 151.00. * You can buy your tickets on the website Videotron Centre / Gestev. Founded in New York in 1973 by guitarist / singer Paul Stanley and bassist / singer Gene Simmons, KISS is one of the most prolific rock bands in the world of Heavy rock history with more than 150 million albums sold worldwide. A total of 20 studio albums have been produced and released since 1974 and include world-wide hits like Rock and Roll All Night, Detroit Rock City (whose chorus changes with the city where they perform), Shout it Out Loud and of course, I was Made for Loving You. But the one thing that separates them from most rock bands, and the main reason why they are one of the richest in the history of the music industry, is merchandise. Comic books, figurines, lunch boxes and even condoms and a line of cosmetics (you read that right) represent only a small sample of the 2,000 products that members patented during their long career. In July 2009, Stanley, Simmons and their acolytes of the time Éric Singer (drums) and Tommy Thayer (guitar, vocals), whom are still part of the band as of today, had managed to gather more than 90,000 spectators on the Bell Stage of the Plains of Abraham for their concert during the Quebec Summer Festival.